We are the premiere place in New York City that buys diamonds, whether you upgraded and want to get cash for your diamond or split up and want to sell your engagement ring we offer the best and highest prices paid for in cash. You can come in to our New York location or mail in your piece. Remember, no matter the condition or diamond type, how rare the diamond is, how large or small the diamond is, we will give you a quote in 5 minutes. Either come in with your diamond piece or pieces, or you can fill out the free diamond quote form; you also have the option to use our safe (and free!) diamond mail-in option for an expert quote on selling your diamond. We buy all diamonds for the highest cash price in NYC. Sell any type of diamond jewelry pieces, such as rings, engagement rings, loose diamonds, rare, gems, exotic, or any other kind of diamond you have. We have been buying and selling diamonds in the NYC area for over 3 decades and strive to be the best diamond buyer in the NYC area. Just like with your gold, silver, or other luxury pieces, it is always important that you find the most reliable buyer in order to maximize your cash payout. Whether you have gems, loose diamonds or estate jewelry, you will get the best price in the current state of the economy. Being in New York City, you have many options to sell your unwanted diamonds. However, you will be paid less than what your diamonds are actually worth. 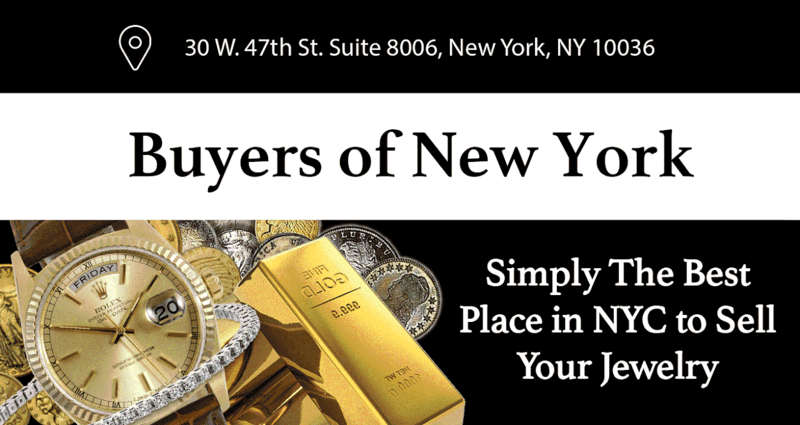 Here at Buyers of New York, you can sell diamonds for the highest amount, and get the money you should be getting.